Today, high tech gadgetry is used to sift gold out of stream and river beds, but this has not always been the case. Historically, gold runners would use just a simple tin pie pan to "pan for gold.” This method allowed the water in the pan to carry away waste, leaving only sand and gold to be separated and, ultimately, sold. You can use a pan, or other basic household items to search for gold at home. Get started in your own creeks, streams and other bodies of moving water. Begin by scooping dirt into your pan, such that the pan is half to two-thirds of the way full. Start with less if you are a beginner, and then work your way up as you get the hang of it. Pick out any foreign matter you can easily see. This is called “pay dirt” for a reason. 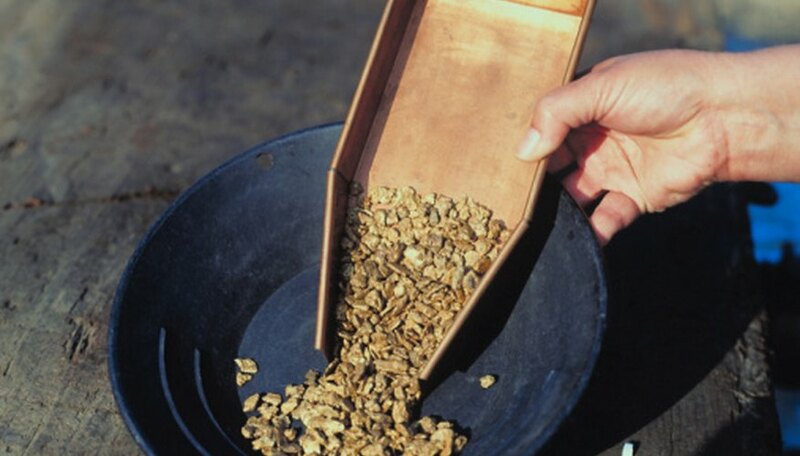 Gold found panning is not typically large nuggets, but rather small flakes, so removing any large particles of foreign matter early in the process lets you get to the good stuff faster. Lower the pan filled with dirt into the water. Fill it to within about 1 inch of the top with clear, clean water. Shake or swirl the pan in a circular motion until it turns the water dirty. This will remove the impurities from the water. Tilt the pan slightly to pour out the dirty water, without disrupting the sand/silt on the bottom. Pick out anything large in your pan. Discard rocks and other foreign objects. You want to eliminate anything in the pan that is not sand or gold flecks. Level the sand, dirt and gold in the bottom of the pan and then lower it back into the water to refill the pan. Swish the pan again, and dump the excess water. Continue repeating the process until only the heavy black sands and fold flecks are still in the pan. Pick through the black sands and gold with tweezers, removing all of the flecks of gold and dropping them into a sandwich bag. Classifying is sorting the particles from the river bed by size. Since most gold particles are very small, using a strainer or sieve to sort through pay dirt, riverbed sand containing gold, can spread up the process. Get at least two sieves, one with 1/2-inch openings and one with 1/4-inch openings. The more sieves you have with openings ranging in size from 1 inch down, the more thorough a job you can do when looking through the material for gold. Scoop the pay dirt onto the sieve about 1 cup at a time and shake the sieve gently to allow small particles to fall through, while larger particles stay on top. Run the dirt through the sieve with larger openings first, and through the smaller sieve afterward. Sift over the top of a bucket so that the smaller particles are caught in the bucket. Panning for gold is typically more successful if you begin in a location where there is gold. As you pan for gold, the foreign material you are washing out of your pan will make the water cloudy. Select a location where the water moves quickly enough to sweep away the cloudiness swiftly, but shallow enough to be comfortable.You should be able to reach the rock bed without going completely underwater. Avoid fast moving water that can both wash golf flecks out of your pan during the panning process and be dangerous for those who are not strong swimmers. Make sure that you break up clumps of sand, clay, mud and other matter that might hide gold. Gold is a heavy metal that settles, and can then get sealed up inside other materials. Use your hands to break apart clumps and then put all the material from the clump back in the pan you are swishing water through. This will allow you to harvest flecks of gold you might otherwise discard.